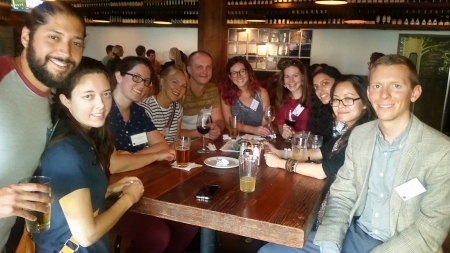 Just before the school year began, CoCom and Pardee RAND hosted a happy hour with students and alumni to welcome the 2016 cohort to the Pardee RAND family. 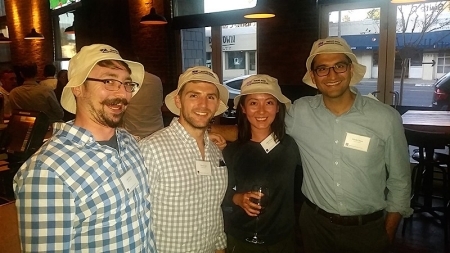 Nearly 50 people attended the event at Stella Barra Pizzeria in Santa Monica, including alumni Adam Gailey (cohort '07), Marlon Graf (cohort '12), Ted Harshberger (cohort '86), Jodi Liu (cohort '12), Mollie Rudnick (cohort '11), and Jon Wong (cohort '12). Members of Cohort '16 were excited to show off their new swag. This photo wasn't posed at all.